The latest "ain't earth weird?" documentary from Werner Herzog focuses on the Chauvet-Pont-d'Arc Cave in southern France, where the oldest known cave paintings offer clues to what humans were like 32,000 years ago. Herzog narrates in his usual faux-naif persona ("Is this where the modern human soul was born? "), and though his verbal shtick grows tiresome, his images never do: the paintings are extraordinary and the 3-D cinematography invites the viewer to get lost in every brushstroke. This is one of the few films to use the format for intellectual, even philosophical ends: the added depth parallels the deeper understanding of humanity that the paintings inspire. Werner Herzog’s spacey, archaeological time trip. 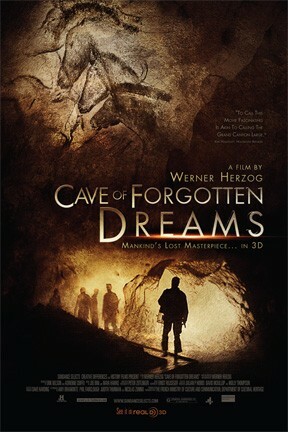 Cave of Forgotten Dreams and Cave of Forgotten Dreams 3D are not showing in any theaters in the area.